Are You Planning An African Safari To Tarangire In Tanzania? Scroll Down..
Kikoti Safari Camp offers a unique Tanzanian safari holiday experience to travellers who value the thrill of wilderness living, far from the usual tourist haunts, down a long, adventurous trail from Arusha, through lightly wooded savannah to the heart of a private game concession of thirty thousand acres owned by the Maasai people. Kikoti, variously translated in Maasai language as “home of shelter”, “meeting place” or “birth place” signifies a new approach to conservation by close co-operation between local people and the camp as they welcome AfricanMecca guests to share their formidable heritage, roamed by lions, giraffes, leopards, wild dogs and vast herds of elephants. The camp is heavily involved with the local people as a source of employment and a craft outlet as well as contributing a fee per client to the development of clinics, schools and anti-poaching measures. 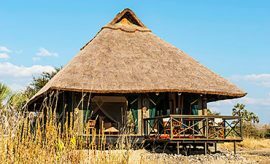 Only four miles from the entrance to Tarangire Park, and overlooking the permanent water of Simanjiro plains, the area teems with thirsty wildlife displaced from their usual haunts during the dry season from July to October. On your Kikoti Safari Camp safari in the private game concession, unrestricted by park regulations, you can walk and drive off-road, guarded by skillful Maasai guides proud to grant you access to the wonders of their world. 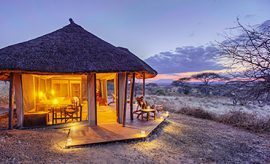 By moonlight, from the safe vantage of stilted thatched tents, you can immerse yourself in the life-throbbing nightlife of a safari in real Africa as lions purr and prowl below, hyena whoop, crickets fiddle and owls add their haunting threnody. 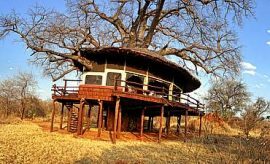 There are a total of 18 enchanting thatched tents raised on stilted platforms accessed by wooden stairs with a netted open view to afford woodland views from covered verandahs supplied with comfortable bowl chairs. In the spacious interior, there is a sitting area and convenient writing desk. Some have double beds. Some have two singles - twins. A third bed can be added for families on safari with children. 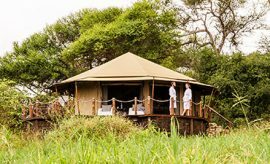 En-suite tented bathrooms feature shower, flush toilet and double wash bowls. Tanked water is on tap, warm water is solar heated, and bottled drinking water is supplied daily. Solar panels provide electric light. Furnishings of dark, polished hibiscus tree wood are simple but elegant. Cream, lemon, beige and apricot linens and mats complement earth-red cushions and floating mosquito nets to afford an airy, yet cozy, Africa travel ambience. At the beginning of your Tarangire trip with AfricanMecca, the welcome is authentic and spontaneous. You are met with smiles, drinks and refreshing damp towels after your dusty drive. 30 staff members include trained and experienced bush guides, guards and attendants, catering and domestic workers, many of them Maasai. They are all friendly and communicative, particularly with children who enjoy special activities such as making bows and arrows. 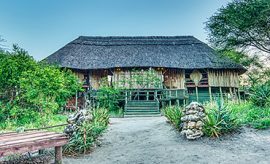 The main lodge, a double thatched rondavel holds the bar, lounge and dining area with a wood and rope outdoor settle for communal relaxation around a fire pit. Life-size human figures welcome you at Kikoti Camp to a well-stocked boutique. Twice daily, in the early morning and at late afternoons through dusk or on a full day, game viewing drives are organized in customized 4-wheel drive guided vehicles to seek out the spectacular wildlife of the Tarangire. Skilled AfricanMecca guides share their knowledge to track down the game you most desire to watch during your stay at Kikoti Camp. 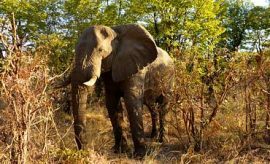 There is so much to see and do on tour in Tarangire that you could spend a day exploring the Tarangire River, where hundreds of elephant dig for water, closely followed by thousands of parched ungulates. Dry-land gerenuks with tiny heads, slender necks and long ears like small wind-vanes, and kudu with curly horns are both rarely seen in other Tanzanian safari national parks and reserves. Fringe-eared oryx with straight lance horns carved with spirals are also dry land denizens. Camouflaged leopard lurk in forks of acacia trees. Dazzles of zebra, graceful giraffe, lithe tawny lions, gawky gnu and menacing African Cape Buffalo crowd the banks of shrinking rivers and gather on spongy carpets of Silale Swamp. The Silale Swamp is home to one of the most important breeding bird species site in the world, from enormous ostriches, fluffing stumpy wings like pigeon-toed ballerinas in tutus, to tiny red and yellow barbets, scintillating in sunlight. Flashing flocks of Yellow Collared Sunbirds with white ringed eyes contrast shockingly with prehistoric Ground Hornbills, like huge tattered crows with heavy beaks, and red wattled necks, said to be the longest living birds of all. Nocturnal game drives and dawn balloon flights are all spoiled for choice options on your unforgettable tour in Tanzania. Food at Kikoti Safari Camp is home-cooked, plentiful and delicious with freshly baked bread, and locally grown fruit and vegetables in season. Special diets can be catered to with advance request. On request, mornings begin with a discreet wake-up call announcing the arrival of a tray with cups, fresh creamer and a pot of fresh-brewed, aromatic Tanzanian tea or coffee in a pot, placed on the table of your private verandah. Buffet breakfast consists of bread, cereals, yoghurt, fruit, nuts, and juice, with toast and eggs. Breakfast and lunch boxes are available for meals in the bush. Lunch in camp is a served menu. Follow this with a self-indulgent siesta, standard on tour in Africa, before taking afternoon tea outside the bar, watching orange and yellow sunbirds and azure superb starlings squabbling on the bird-table. The bar itself is cool and shaded, skillfully carved with ebony animal figures on a pale background of jacaranda wood, and with a live, resident genet peering from above. Sundowner cocktails are an African vacations ritual left over from Colonial times, when drinks and yarns were enjoyed around a campfire in the bush. In the evenings, enjoy pre-dinner drinks supplemented with an evening meal menu served in the dining room or on alternate days, a buffet dinner is served in a thorn-enclosed Maasai Boma with ethnic dance displays. Jambo Raza, It was a wonderful experience in Tanzania. Thoroughly enjoyed the game drives. Rogers, our guide was superb; knowledgeable, helpful, and very friendly. Everything ran smoothly. Dear Raza, We arrived home on Sunday full of happy memories of our holiday. Emmanuel our driver was a top guide. Very knowledgeable about the animals and the parks. Thank you so much for making this a holiday to remember. Raza, we had an incredible time and this is largely due to you and your staff's exceptional advice and flexibility in accommodating our needs. We will both vouch that AfricanMecca's quality for customer service is beyond reproach. The Tanzania safari was a trip that will remain in our memories as one of the best. The guide we had for the safari was named Babu and he was professional, knowledgeable & attentive. I will definitely use your company for any future trips. 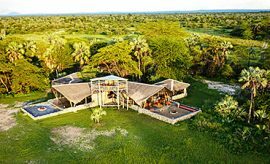 When staying at Kikoti Safari Camp in Tarangire, we recommend combining it with your Northern Tanzania safari to Lake Manyara, Ngorongoro Crater and Serengeti (wildebeest migration). End your trip with a Swahili cultural tour and beach holiday in Zanzibar. ARE YOU PLANNING AN AFRICAN SAFARI TO TARANGIRE IN TANZANIA? HAVE YOU VISITED TARANGIRE FOR AN AFRICA SAFARI IN TANZANIA?